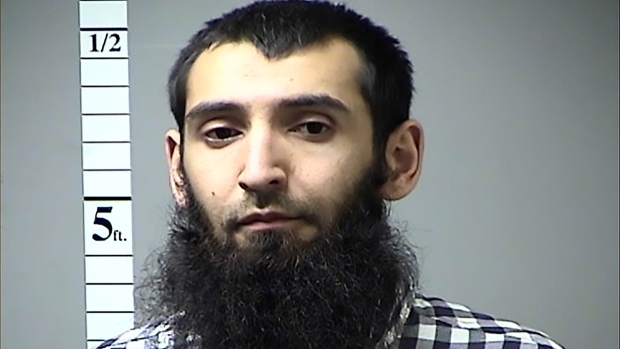 An Uzbek immigrant has been charged by US prosecutors with causing the deaths of at least eight people in New York by mowing them down in a truck. Sayfullo Saipov, 29, is also accused of providing material support and resources to Islamic State (IS) group. He was shot and injured by police at the scene of the attack, and received treatment in hospital. Prosecutors say he spoke freely to them, waiving his right to avoid self-incrimination while in custody. Tuesday afternoon's attack saw a truck driven down a cycle lane in Lower Manhattan, hitting cyclists and pedestrians. Six people died at the scene and two more in hospital. Twelve people were injured, nine of whom remain in hospital. Earlier, New York Police's Deputy Commissioner John Miller told reporters: "He appears to have followed almost exactly to a 'T' the instructions that Isis has put out in its social media channels before, with instructions to their followers on how to carry out such an attack." A second Uzbek man wanted for questioning in connection with the attacks has been found, investigators say. The FBI had requested information on Mukhammadzoir Kadirov, 32. "We are no longer looking for the person the information went out about," William Sweeney, assistant director of the FBI's New York field office, told reporters. "We have found him and I'll leave it at that."